I had a request from a co-worker for a wedding card with an elephant on it. 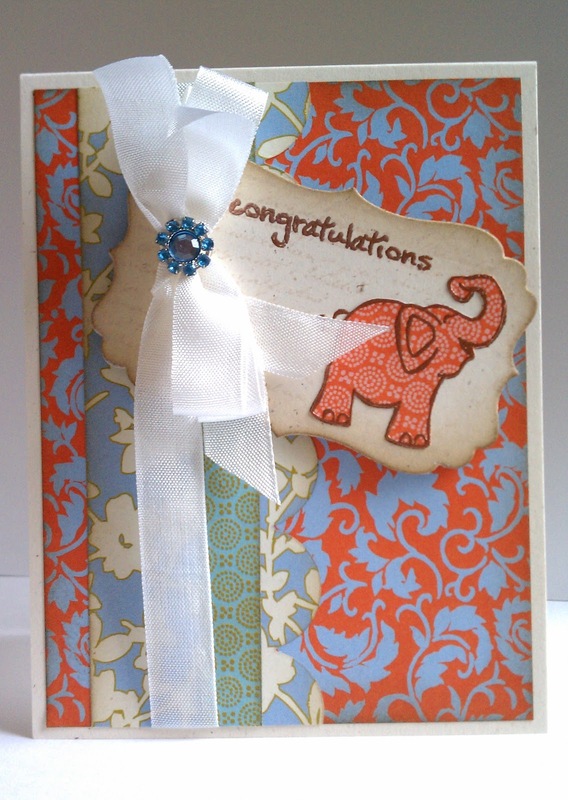 Her nephew is getting married and after the wedding he and his bride are traveling to India so she thought an elephant would be a fun addition to the card. Here's what I came up with using a Hero Arts elephant I had. I even finished the inside of the card with a sentiment from MFT, a few strips of 7 gypsies designer paper and some Walnut Stain Distress ink sponged on the edges. Thanks so much for stopping. Happy Stamping! 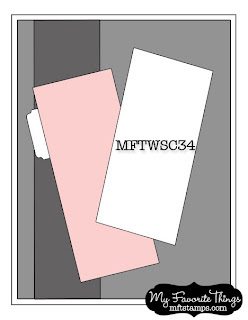 Today's card features the MFT Let's Go For a Walk set. I just love those dogs in their party hats so I inked them up and added some Copic coloring. The patterned papers are from 7 gypsies. For a splash of fun I added a doily and some twine before calling it good. Thanks so much for stopping by. I hope your week is off to a great start. Happy Stamping! For my card I used the Rain or Shine set from My Favorite Things and added a couple of die cut clouds just for fun. Sorry about the less than great photo of the card (note the sun streak down the clouds). It seems like I either have sun streaming in the window when I'm trying to take a less than ideal photo or it's dark so there's no natural light. I need to work on timing my photo sessions better. Happy Saturday everyone. I hope you have something fun planned for today. Thanks for stopping. Happy Stamping! For my card, I used stamps from the March 2010 Kit of the Month. I just love the jukebox stamp in that set. The papers are from the K&Co Blue Awning collection. For fun I added some gemstones and a little white gel pen detail. I'm having the best time adding fabric bits to my cards. I hope you're not tired of this style just yet. I used the scallop heart nestabilities with some warm and natural fabric and then sewed around the heart with a tan thread for a little extra detail. The flower die is from Papertrey Ink. 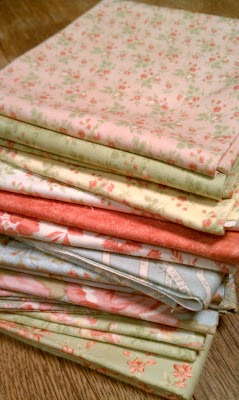 The fabrics are some fat quarters that I got from my Mom. I really like the way this turned out. I think I'm going to have to make some more of this style to put in my stash. I hope you're all having a great day. Thanks so much for stopping. Happy Stamping! I had a request from a friend for some sympathy cards so I pulled out the Papertrey Ink Botanical Silhouettes set and got to work. I started with a piece of PTI Rustic Cream cardstock that I stamped with a Glitz Distressing text stamp using Latte ink from A Muse Studio. Next I stamped the flower stems with SU River Rock and the flowers with Cameo Coral. 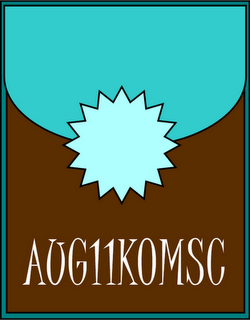 The sentiment is stamped with Memento Rich Cocoa. Finally I sponged Walnut Stain Distress Ink around the edges of the panel before adding some hand-dyed seam binding and button. The seam binding was dyed with Tea Rose Distress Ink and a drop or two of Fired Brick Distress Ink. I was so pleased with how the first card turned out that I made a second card with the same supplies with the exception of the flower stamp (also from the Botanical Silhouette set). Thanks so much for stopping. I hope you're having a wonderful week. Happy Stamping! I posted a couple of weeks ago about some fabric scraps that I got from my Mom and I decided to get out my flower dies and some Warm and Natural that I had to make flower embellishments to go with the fabric scraps. 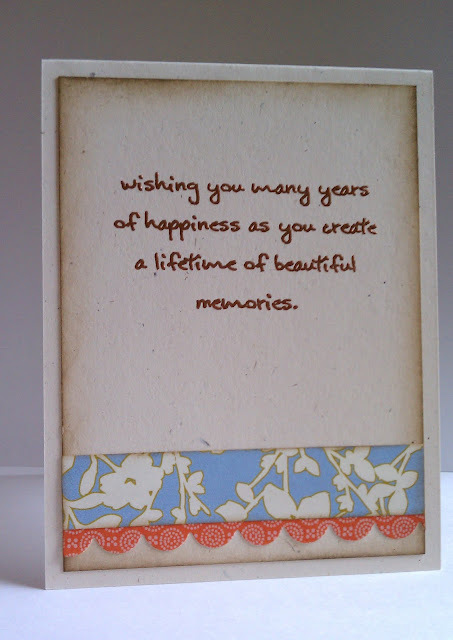 For the first card I used PTI Kraft cardstock with a strip of Rustic Cream for the sentiment. The label die and border stamp is from a|muse studio and the flower die is PTI Beautiful Blooms II #3. I cut two of the large flower and one of the medium and small flower and stitched it together with three small gold beads. 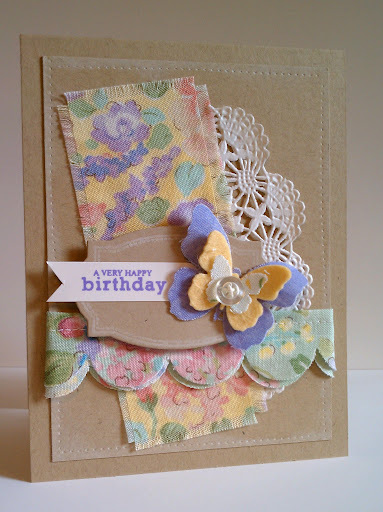 For the second card I used the PTI Beautiful Blooms II #1 die set to create the flower and stitched it together with a button. To adhere the fabric pieces to the cards I used scor-tape because it was much faster than getting out my iron, ironing board and fusible web to create iron-on patches. 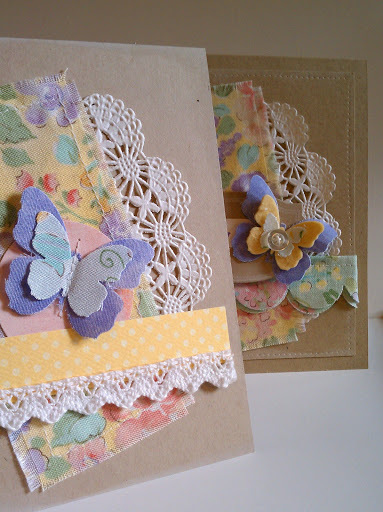 I also used scor-tape to adhere the lace strips on each card. To attach the flowers to the cards I used Helmar 450. I love that stuff for gluing on fabric embellishments. Well, that's all for today. Thanks for stopping. Have a wonderful Wednesday. Happy Stamping! Card Ideas for Paper Crafters is now available for purchase. (This issue used to be called Go-To Sketches.) It contains 72 sketches and four different takes on each sketch. It also happens to include my first published card for Paper Crafts. 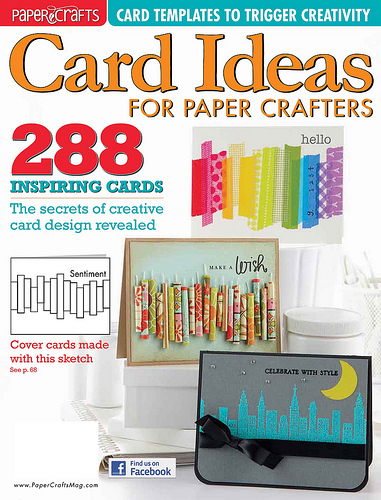 I was very excited when I had one of my cards accepted but then when I got an email from Creative Editor Susan Opel saying that my card had been selected for the cover I was ecstatic! 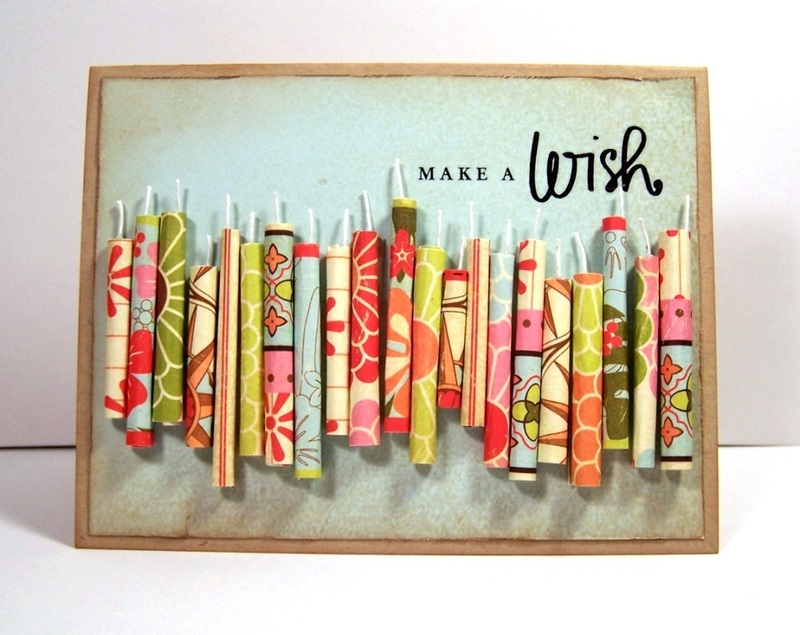 Here's my Candle Wish card that can be found on the cover and page 67. When I saw the sketch that you can see in the cover photo I immediately thought of candles. To create them I cut strips of patterned paper and rolled them around a wooden skewer. To make them look more real I added some waxed floss for wicks. Be sure to check out this issue if you haven't already. There are so many great ideas in it plus the added bonus of all those sketches for a starting point. Thanks for stopping by and letting me share in my excitement. I hope you all have a wonderful weekend. Happy Stamping! I found some tins at a sale awhile back and while I didn't have a plan for them when I bought them I knew they would come in handy. Yesterday I had the idea to decorate them for teacher gifts. I pulled out some paper, ink, stamps and dies then got to work. Here's a look at the top of the tins. For the black background piece I used my Corner Chomper to round the corners and then stamped the numbers from Glitz Distressing stamp set using ColorBox Frost White pigment ink. I was going for a chalkboard look. For the focal piece on the top I decided it should be a magnet. That way it can be removed and placed anywhere. The larger piece is a die from My Favorite Things. I cut out a layer of chipboard and a layer of SU Red Riding Hood cardstock and glued them together. The red cardstock was then stamped with the grid pattern stamp also from the Glitz Distressing stamp set using Versamark ink. The next layer is PTI's Fillable Frames die with matching stamp set for the border (also stamped with ColorBox White Frost pigment ink). The sentiments are from PTI's Teacher's Apple set and stamped with Memento Tuxedo Black and SU Real Red on SU Crumb Cake cardstock. That piece is mounted with foam dimensionals. For the finishing touches there is an apple also from PTI's Teacher's Apple set stamped with SU Real Red, Kiwi Kiss and Chocolate Chip inks and a bow of Charcoal twine from The Twinery. I add a piece of SU Crumb Cake cardstock with a stamped apple to the back of the tin to cover up the printing on the tin. This would be a nice place to personalize the tin for the teacher or have your student write a little note. For now my tins are empty but you could fill them with any number of things including notecards, a gift card, candy . . . just to name a few. I was helping my Mom yesterday prep for a fabric sale and scored some beautiful fat quarters and some assorted scraps that I thought would be lovely on cards. So, when I got home I immediately Sat down and made a couple of cards. I used pieces of a paper doily and the butterfly dies from A Muse Studios along with my fabric scraps. Thanks so much for stopping. I'm off to help my mom with the sale. I have two more Dare to Get Dirty challenge cards to share with you today. 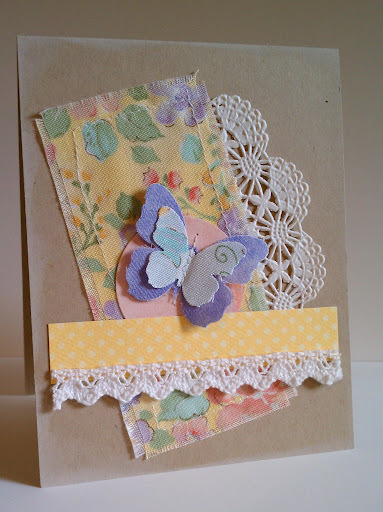 The first card is for the Garden's Bounty challenge and uses Whipper Snapper stamps. The super cute jar stamp is from the Garden Fresh set and the sentiment is from the Cupcakes & Sprinkles set both cling sets are designed by Anna Wight for Whipper Snapper. I stamped the jar and colored it with Copics. The designer papers are from the Gertie collection of My Mind's Eye Stella & Rose line. The second card is for the Christmas in July challenge and uses a PSX stamp. I found this wonderful truck stamp at a garage sale and I love it! When I saw the challenge I knew it was time to ink up this stamp. The papers are from Basic Grey's Jovial line. Thanks so much for stopping by. I hope you've had a wonderful week. We're off on a camping trip this weekend with both of my Brother's and Sister's-in-law. It should be a fun adult trip. I'm a little sad about the 60% chance of rain for Saturday but we'll cross our fingers. For today's post I have a couple of cards for the first two challenges of the Dare to Get Dirty Challenges for Splitcoaststampers. For more information on the challenges, check out this link. My card for the first challenge uses the SU Fresh Fruit set, paint and papers from the K&Company Amy Butler Lucky Flowers collection. 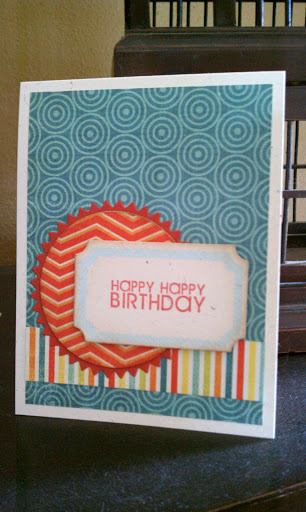 My card for the second challenge uses AMuse Studio's Life is a Song stamp set, kraft and black cardstock, papers from My Mind's Eye Stella & Rose line (Hattie collection). Thanks so much for stopping by. I hope you're having a wonderful Wednesday! Happy Stamping! Today I have a birthday card to share with you. 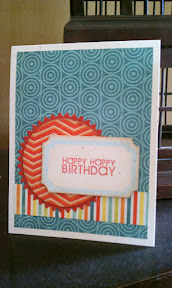 It uses Alphabet Soup papers from My Minds Eye and stamps from Papertrey Ink. Thanks so much for stopping by. I hope you're week is off to a great start. Happy Stamping!